To support the development of global strategies against breast cancer, this study reviews available economic evidence on breast cancer control in low- and middle-income countries (LMICs). 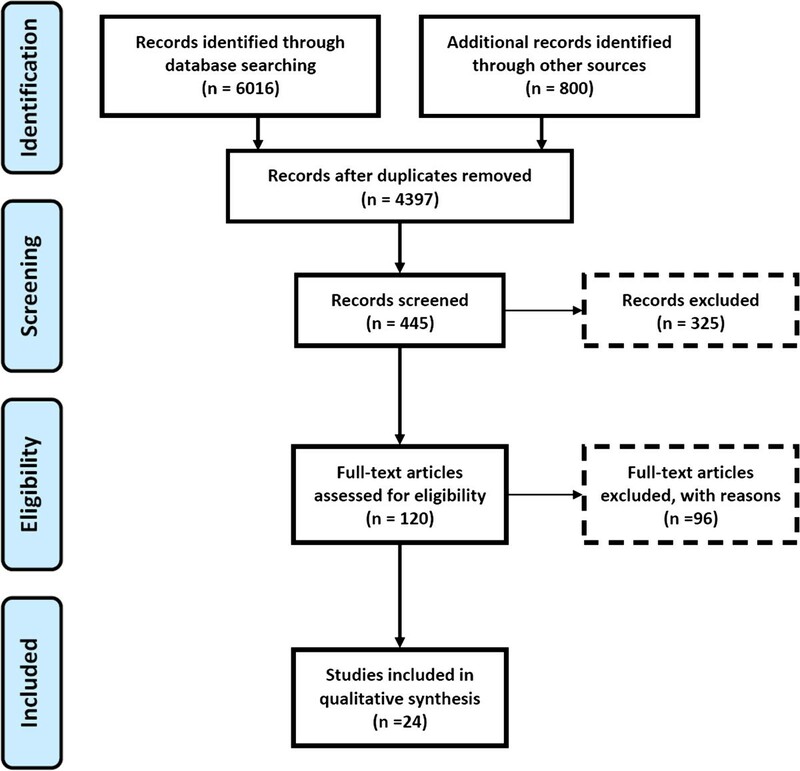 A systematic article search was conducted through electronic scientific databases, and studies were included only if they concerned breast cancer, used original data, and originated from LMICs. Independent assessment of inclusion criteria yielded 24 studies that evaluated different kinds of screening, diagnostic, and therapeutic interventions in various age and risk groups. Studies were synthesized and appraised through the use of a checklist, designed for evaluating economic analyses. The majority of these studies were of poor quality, particularly in examining costs. Studies demonstrated the economic attractiveness of breast cancer screening strategies, and of novel treatment and diagnostic interventions. This review shows that the evidence base to guide strategies for breast cancer control in LMICs is limited and of poor quality. The limited evidence base suggests that screening strategies may be economically attractive in LMICs – yet there is very little evidence to provide specific recommendations on screening by mammography versus clinical breast examination, the frequency of screening, or the target population. These results demonstrate the need for more economic analyses that are of better quality, cover a comprehensive set of interventions and result in clear policy recommendations. Noncommunicable diseases (NCDs) have become increasingly important in low- and middle-income countries (LMICs). Once considered a problem only in high-income countries (HICs), more and more patients who suffer from cancers and other NCDs are now observed in LMICs . This is mainly due to the ageing populations and changing lifestyles in LMICs . The global importance of NCDs has recently been acknowledged through the UN Summit on NCDs, held by the UN General Assembly in September 2011. As highlighted in the summit, the most prominent cause of cancer death among women in LMICs is breast cancer, accounting for 269,000 deaths (12.7% of all cancer deaths) in 2008 [3, 4]. In HICs, many efforts have been undertaken to control breast cancer, leading to various improvements in breast cancer outcomes [5, 6]. Strategies for breast cancer control are geared towards early detection and early treatment, and although its benefits are still open to discussion [7–9], mammography screening has been widely implemented [10–12]. In these countries, the selection of breast cancer control strategies has often been guided by economic analyses, demonstrating the value of alternative interventions [13–16]. In contrast to the established breast cancer control strategies in HICs, breast cancer is often neglected in LMICs and control strategies lack evidence-based information [17–20]. Policy-makers in LMICs cannot adopt similar breast cancer control strategies as implemented in HICs because most LMICs rely on much smaller budgets, and both the costs and effectiveness of control strategies are highly dependent on the population characteristics and the functioning of the health system [11, 20, 21]. Against this background, the present review provides an inventory of economic analyses of breast cancer control in LMICs. The paper’s objectives are to present the available economic evidence from LMICs and to assess the methodological quality of the analyses. This research could improve the evidence base on cost-effective breast cancer interventions and could strengthen breast cancer control policy in LMICs. In this review, we analyzed publications from the MEDLINE index using PubMed, the Web of Science, Scopus, and Google Scholar. We searched the literature using the keyword ‘breast cancer’, combined with the keywords: ‘developing countries’, ‘Asia’, ‘USSR’, ‘Middle-East’, ‘Eastern Europe’, ‘West-Indies’, ‘China’, ‘Russia’, ‘India’, ‘Africa’, or ‘limited resource’, or combined with: ‘cost-benefit’, ‘cost-effectiveness’, ‘costing’, or ‘cost analysis’. Additionally, we searched these indexes using ‘breast neoplasms’, ‘developing countries,’ and ‘economics’ in MeSH terms. Our search took place in January 2013, and was limited to publications in English. Studies were included only if they concerned breast cancer and originated from LMICs as listed by The World Bank . The selection process is shown in Figure 1. In step 1, articles found by our search in the various indexes were merged in a database, which was then corrected for duplications (in Google Scholar, because of the large number of articles founds, we screened titles until the point that we did not find any further relevant title among the last 500 screened titles; in total, we screened 800 titles in this database). In step 2 we screened the titles of these articles, in step 3 the abstracts and in step 4 the remaining articles were read completely. We excluded publications for which no full-text article versions were available, or those not published in English. Furthermore, we excluded articles that only mentioned costs or cost-effectiveness without presenting original data. Prisma statement 1: Prisma 2009 flow diagram. We documented the following characteristics from the reviewed articles: country or region, base year of cost data, study population, and breast cancer stage(s) considered. The stage was categorized as stage I to IV according to the American Joint Committee on Cancer . We documented the following methodological characteristics: type of economic evaluation –cost analysis or cost of illness analysis, separately reported costs and effects, cost-effectiveness analysis, cost–benefit analysis, and cost–utility analysis; study design – experimental, observational (cohort, case control, or cross-sectional), model based, and other designs; study perspective – non-healthcare perspective (for example, productivity loss, travel costs, co-payments), healthcare perspective (for example, hospital administration costs, treatment costs), and societal perspective including non-healthcare and healthcare costs; time horizon; and outcome measure for effectiveness (disability-adjusted life years, quality-adjusted life years, life years saved, lives saved, and intermediate outcome measures). The following qualitative characteristics were documented: sources for estimation of effectiveness, sources for estimation of resource utilization, discount rates used, sensitivity analysis for assumptions, and reported incremental analysis. We classified sources for estimation of effectiveness and resource utilization by primary data collection (for example, patients, questionnaires), secondary data collection (for example, records), literature based, expert opinion, and other. We also noted whether discount rates were used on costs, effects, both costs and effects, or not at all. We also registered the study objective, the evaluated interventions, and the main study conclusions for each reviewed article. We used an established checklist by Drummond and Jefferson to judge the quality of the economic evaluations [24, 25]. A three-point response scale was added, similar to Gerard and colleagues , to more specifically grade the quality of each item on the checklist. Scores on this scale ranged from 0 (not considered), to 1 (partially considered) to 2 (fully considered). A few adjustments to the checklist by Drummond and Jefferson were necessary to create a more responsive scoring system for our particular set of economic studies. We removed those items that were not applicable to any of the reviewed studies (for example, on productivity changes), and combined some items that were otherwise putting too much emphasis to certain domains in the overall score (for example, on health state valuations and discount rates). The adapted checklist is provided in Table 1. We summed up all scores, and compared this with the maximum attainable score to calculate the mean quality score of a study (as a percentage of the maximum attainable score). We accounted for items that were not relevant to the study under scrutiny (for example, studies that studied costs and effects in a single year were not criticized for not applying any discount rate in the analyses). 12. Data and methods used to value health states and other benefits are stated and justified. 16. Methods for the estimation of quantities and unit costs are described and justified. This checklist was adapted from Drummond and Jefferson . Two reviewers (SGZ and RMB) evaluated each publication for conformance with this checklist, and consensus was reached when scores differed. We followed PRISMA guidelines for reporting this systematic review. The stepwise selection of articles by our selection criteria is presented in Figure 1. Our search strategy resulted in a total of 6,816 studies: 679 studies from PubMed, 328 studies from Web of Science, 5,009 studies from Scopus, and 800 from Google Scholar, respectively. In step 1, by merging the results of all individual search strategies and excluding duplication, the total number of hits was reduced to almost 4,400. Upon screening of titles (step 2), abstracts (step 3) and full texts (step 4), we eventually identified 24 articles that met our inclusion criteria. Table 2 describes the baseline characteristics of the 24 included studies. We found eight studies from Asia, most concerning China, India and Iran. Five studies were on a global or sub-regional level, while there were five studies from Africa, three from Europe and three from Latin America. A total of 10 studies evaluated breast cancer screening in combination with treatment (n = 10), assessing mammography screening (n = 9), clinical breast examination (CBE) (n = 3), magnetic resonance imaging (n = 1), ultrasound (n = 1), biopsy (n = 1), elasticity imaging (n = 1), and tactile imaging (n = 1), respectively [26–36]. These studies evaluated a variety of age groups and screening frequencies (Table 3). One study reported on a mass-media intervention to improve the early detection of breast cancer in Ghana . Seven studies evaluated only treatment interventions including drug therapy (n = 4), oophorectomy (n = 1), radiotherapy (n = 1), and treatment in general (n = 1) [37–42]. Other studies examined the costs of diagnostic interventions (n = 3) or did not consider a specific intervention (n = 2) [43–48]. DALYs, disability-adjusted life years; FNA, fine needle aspiration; NA, not applicable; QALYs, quality-adjusted life years. To review the diagnostic accuracy, procedure cost, and cost-effectiveness of currently available techniques for breast screening and diagnosis. Adjuvant oophorectomy and tamoxifen vs. oophorectomy and tamoxifen for recurrence after observation. CEA, cost-effectiveness analysis; CBE, clinical breast examination; DALY, disability-adjusted life year; FNA, fine needle aspiration; LMIC, low- and middle-income country; NCD, noncommunicable disease; QALY, quality-adjusted life year; WHO, World Health Organization. The methodological study characteristics of the reviewed studies are presented in Table 2. The base year of cost data in the included studies was generally not from before year 2000, and could not be identified in eight studies. The majority of studies combined both costs and effects in a single cost-effectiveness estimate (n = 13), and the majority of these were based on mathematical models (n = 9). Most studies used a healthcare perspective (n = 19), and only one study included non-healthcare costs . Studies used a time horizon varying between 5 weeks and the lifetime of the study population. Most reviewed studies used intermediate outcome measures (that is, clinical effects n = 8), life years saved (n = 6), or disability-adjusted life years (n = 5) as their main effectiveness outcome, while quality-adjusted life years were less frequently used (n = 3). Table 4 summarizes the quality of the included studies, as indicated by the percentage score. The quality of all studies ranges from 23 to 86%. Studies by Ginsberg and colleagues, Zelle and colleagues, and Bai and colleagues had the highest total average scores, and these were all modeling studies [27, 35, 42]. If items were not applicable (NA) for a reviewed paper, the maximum obtainable (domain) score was reduced with 2 points per item. Studies generally scored poorly on the domain ‘estimation of costs’, at an average 34% of the maximum obtainable score across all studies. The average score for ‘study design’ was 73%, while the quality of the domains ‘estimation of effectiveness’, ‘analysis’, and ‘interpretation of results’ was scores as 70%, 51%, and 68%, respectively. As described earlier, most studies evaluated breast cancer screening in combination with treatment. Studies in Mexico, Poland, Turkey identified mammography screening as a cost-effective intervention [31, 33, 34, 36], whereas studies in India, Ghana and Egypt found other strategies (such as CBE screening or mass-media awareness raising) to be economically more attractive (Table 3) [26, 30, 35]. Sarvazyan and colleagues proposed another breast cancer screening option: tactile imaging as an alternative to several other interventions . Studies evaluating treatment interventions typically favored the novel interventions. Anastrozole was more cost-effective than tamoxifen in a Brazilian study , oophorectomy and tamoxifen after recurrence was shown to be favorable in Vietnamese and Chinese patients , additional radiotherapy after breast-conserving surgery was very cost-effective in China , and chemotherapy consisting of a docetaxel and cyclophosphamide regimen was more attractive compared with an doxorubicin and cyclophosphamide regimen also in Chinese patients . There was only one study with a negative suggestion for the novel and more costly intervention docetaxel, doxorubicin, cyclophosphamide, as compared with the more conventional 5-fluorouracil, doxorubicin, dyclophosphamide regime . Studies that only assessed costs and did not include effectiveness estimates, reported on costs of breast cancer for patient management in Brazil (US$1,646 per patient) , and the costs of patient expenditure (US$242 per patient) in India . The three studies evaluating diagnostic interventions demonstrated the economic attractiveness of inexpensive interventions; that is, fine-needle aspiration cytology and methylene blue dye injections [45–47]. These interventions could be especially relevant for diagnosing breast cancer in rural settings and settings with low resources. This study shows that there is limited economic evidence on breast cancer control in LMICs. Only 24 economic evaluation studies were found in this review, and their quality was generally poor. Furthermore, the study populations were very diverse, as most studies examined different kinds of screening and therapeutic interventions in various age and risk groups. Owing to this poor availability, quality, and comparability, we conclude that the economic evidence base to guide strategies for breast cancer in LMICs is currently insufficient. Our review raises a few discussion points. First, there is mixed evidence on the economic attractiveness of mammography screening. Studies in Mexico, Poland and Turkey demonstrate the intervention to be cost-effective, whereas studies in India, Ghana, and Egypt suggests that other forms of screening – for example, by CBE – provide more value for money. The evidence base is too small to generalize these findings to other LMICs, and to draw general conclusions. Also, most of the studies evaluating therapeutic interventions seem to favor the more novel – and often more expensive – therapy. These findings may be explained by many reasons, including the higher effectiveness of the novel interventions but possibly also the association between funding sources and pro-industry conclusions . Second, in general, we found that the quality of the reviewed articles was poor. The majority of studies failed to score at least 50% on every domain (‘study design’, ‘estimation of effectiveness’, ‘estimation of costs’, ‘analysis’, and ‘interpretation of results’). These domain scores further show that most emphasis was given to the design of the studies and the interpretation of results, whereas costs, in particular, were poorly evaluated. This calls for better adherence of studies to methodological standards for economic analyses, or the development of such standards specifically for breast cancer research. Future studies could be improved by using a checklist, and through transparent reporting of the items in checklists [25, 51]. Third, the current evidence base leaves many LMICs with the difficult task of extrapolating results from other countries. The transferability of economic evaluations across countries is complicated, as clinical practice patterns, healthcare systems, and cultural and ethical practices differ across countries [52, 53]. Standardized ways of adopting economic evaluations, with the help of available checklists and guidelines [24, 25, 51, 54–58], may improve this lack of transferability. Alternatively, modeling studies could play an important role in extrapolating results from one context to another. Modeling studies, however, rely on the availability of costing and effectiveness data, and this emphasizes the need for more primary data collection on these aspects in LMICs. With data from such studies, researchers would not have to continue to rely on sensitivity analyses or extrapolating cost estimates from data in HICs. National cancer registries, mortality databases, hospital registries, and accessible publications would be essential for providing such information . Fourth, and closely related, we generally advocate the use of modeling studies in the economic analysis of breast cancer control in LMICs. In addition to their use in the extrapolation of study findings, they generally appeared to be of high quality, are sufficiently flexible to include important methodological characteristics such as adequate time horizon, and seem also appropriate to evaluate a broad array of interventions across different groups. Fifth, the most adopted type of economic evaluation was cost-effectiveness analysis, using a healthcare perspective and life years saved as the primary outcome. Although cost-effectiveness analyses using a healthcare perspective contribute very important information, productivity losses for patients suffering from breast cancer – and most probably other NCDs – can be substantial [60, 61]. So far, there is no methodological consensus on estimating productivity loss and the cost of illness can vary greatly between different costing approaches (for example, human capital approach vs. friction cost approach) and also between gender, age and the type of job of patients . Further research should account for economic and social characteristics of the population under study, and should try to investigate productivity losses. Additionally, life years saved may be a less appropriate outcome when palliative or preventive interventions are investigated, and the use of disability-adjusted or quality-adjusted life years may be more appropriate. Sixth, there is currently very little economic evidence on less established interventions such as tactile imaging, awareness raising, CBE screening, or preventive and palliative interventions. Economic studies, especially in LMICs, should aim to evaluate these interventions more often (and thereby including broad target populations) as they have the potential to be economically attractive [26, 30, 32, 35]. Finally, guidance in decision-making and recommendations for implementation are generally underemphasized in economic evaluations. By reflecting on the health system characteristics of the particular country and considering them in implementation recommendations, economic evaluations could improve their use in breast cancer policy development. Our study has a number of limitations. Primarily, the number of articles reviewed is very limited, possibly the result of our search strategy. Besides a possible publication bias – studies with negative outcomes are less likely to be published – we searched only for articles published in English. This may explain the relatively small number of articles found, for instance, from Spanish-speaking regions or from countries where there is less emphasis on publishing research (for example, in Africa). Also, the studies included in our review vastly differed with regard to their methodology, objectives, characteristics, and study populations and hence are difficult to compare. In addition, our quality assessment of the reviewed articles was based on a checklist that gives highest scores to a full reporting of all domains. However, short reports in the form of, for example, editorials may not include all these details but may nevertheless be valid for the goals they serve. Hence, the scores for these studies should be interpreted with caution. To conclude, our findings indicate that research on the costs and cost-effectiveness of breast cancer control in LMICs is still in its infancy. The limited evidence base suggests that screening strategies may be economically attractive in LMICs – yet there is very little evidence to provide specific recommendations (on screening by mammography vs. CBE, the frequency of screening, or the target population). These results demonstrate the need for more economic analysis that are uniform, of better quality, cover a comprehensive set of interventions and result in clear policy recommendations. The authors thank Dr Ernst Spaan and Evelinn Mikkelsen for sharing their experience and search strategy on a large health insurance review, which has helped us in setting up our search strategy and with maintaining our search results. No direct funding was received for this study. SGZ and RMB were salaried by their institutions during the period of writing though no specific salary was set aside or given for the writing of this paper. No funding bodies had any role in the study design, data collection, analysis, decision to publish or preparation of the manuscript. SGZ performed the search strategy, designed the inclusion criteria, reviewed all papers included in the review, developed the evaluation strategy and drafted the manuscript. RMB participated in the design of the study, the selection of relevant articles, the evaluation and classification of articles and contributed to the writing of the manuscript. Both authors reviewed and critically assessed the papers included in this review.